I’m loving the abundant harvests as well as the pretty flowers from my runner beans. They’ve been added to the equally plentiful courgettes, onions, garlic and tomatoes, cooked slowly in a sort of ratatouille with extra olive oil, basil and parsley added at the end. …. along with the increasingly dewy mornings and darker evenings, the colours are getting richer. Purple hues from the ripening figs at the front of the house, the dusty skinned damsons in the hedgerows, verbena and the ubiquitous orache that’s rapidly going to seed. Magenta, violets and deep pinks from sweet peas and the last few knautia. It’s lovely to still have some fresh lime greens to enjoy in the nicotiana and dill flowers amongst all these bold, late summerv colours. ….if you start looking amongst the still lush growth, it’s not hard to spot squashes lurking everywhere. Another reminder that Autumn is just around the corner. The uchiki kuri and mother hubbard squashes I’ve grown this year seem to have grown so speedily (helped by a perfect summer of course) and some of them are HUGE. Some of those silvery grey squashes have an other-worldly quality to them. I just hope they’re tasty as we’re definitely going to have plenty of them. Although I’ve been as tardy as ever on the weeding front, the one area I’m really making an attempt at keeping weed free is the newly planted asparagus area. I grew about 30 plants from seed this year, they germinated really easily and I really want to give them a chance. I know I have a long wait (3 years) before harvest. Still, the thought of freshly gathered asparagus, taken straight from garden to kitchen, with no chance to lose any of that wonderful flavour, is encouraging even me to weed fastidiously. The beets are feeding us well. The chard, with its vibrant ruby red and sunny yellow stems lifts my spirits every time I wander into the garden. While there is so much beetroot it’s being roasted, grated in salads, boiled and dressed with balsamic. And given away. ….the cold-frame is pretty much abandoned as everything has long since been planted out. The only seedlings still sheltering there are my chop suey or chrysanthemum greens. a regular favourite of mine at this time of year, they grow quickly and easily, while providing tasty green leaves and very pretty flowers into the Autumn months, when most things are going to seed or are rapidly fading. The Autumn fruiting raspberries are providing tasty pickings daily and the Quince tree appears to still have about 25 fruit on its branches. I have been counting each one of these in awe as our only previous harvest from this tree (the first we planted in this garden nearly 3 years ago) has been the grand total of one. All this mellow fruitfulness gives me mixed feelings. Lovely to have new harvests to look forward to, but all these signs of Autumn approaching keep reminding me we only have a couple of days left of the summer holiday. Soon there’ll be a lot fewer weekday hours of children rampaging around the veggies, picking the calendula and sweet peas. At least I’m glad that the last few days have seen the garden full of children running wild; toddlers dipping in the paddling pool then playing in mud; the strength of the hammock being tested by piles of children and the tent and tree house being played and picnicked in. Lots of squashed and trampled plants around the edges of beds. Surely exactly as the last few days of the summer hols should be. Have really been enjoying Lizzie Moult’s Garden ShareCollective, offering a peep into gardens around the world and would love to join in again this month. My tomatoes are finally ripening and there are cucumbers lurking among the tangle of herbs that enjoy the sun against the side of our house. In fact the cucumbers are rapidly becoming entangled with the cherry tomatoes. I’m loving the abundance of parsley lining the strawberry bed, while the mint is rampaging as usual in places it shouldn’t. As usual, rather than getting round to tackling my unruly herbs and veggies, I’m focusing more on how I can eat them. Fattoush seems a perfect way of making good use of what’s currently plentiful. Especially as it uses up some of the flatbread I keep coming across when rummaging in the unknown depths of the freezer. As the sun is still shining and I’m in denial that this is really the last week of the school summer holiday, simple salads and barbeque food are also what I’m still craving. I vary the quantities and ingredients for this, depending on what’s available in the garden. So before the cucumbers had grown, in my lazy summery mode I happily made it without them, rather than get in the car. My radish are rapidly going to seed, which is very pretty (and you can eat the pods) but I’m finding a few crazy giant ones to chop into this. And when I’m short of spring onions, my much favoured egyptian walking onions are often substituted. Toast the flatbread until crisp. Peel the cucumber, chop into chunks. slice the radish and chop the tomatoes roughly. Tear the toasted flatbread into small chunks, and combine with the vegetables, herbs, oil, lemon juice and season with salt and pepper to taste in a bowl. Very simple and easy to assemble, this is great with fish or on its own as a lunch. Maybe with a little dukkah and more flatbread. 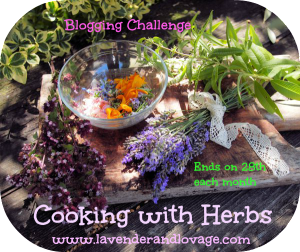 Would love to enter this into Karen from Lavender and Lovage’s inspiring August cooking with herbs challenge. And very much hoping that the summery weather is going to continue for the rest of the hols. Encouraging me to lazy garden, eat simple food, and to gather more mint for mint tea or mohitos, rather than tackle the harder labour of digging up huge clumps of the stuff! I spent a day watching Ruby and friends playing in a Cotswold stream this week. Loving the simple pleasure they took amusing themselves for hours, just with a fishing net, a few buckets and lots of water. Oh and crocs which they did their best to lose in the stream. Last night we slept in a tent in the garden after toasting marshmallows of course. Now I’m very sleep deprived but thinking how much I’m loving these summer holidays. I don’t want to dwell on quite how fast they’re flying past, I’d be quite happy with a few more months of picnics in playgrounds and trips to the seaside. School dresses have been languishing somewhere in the forgotten ironing pile for a long time. And somewhere there are school cardigans that I retrieved from Lost Property at the end of term. I’m always sure that I label all of the school uniform and can’t quite work out how much of it ends up either in Lost Property or just disappearing forever into the cloakroom black hole. My shoddiness obviously has something to do with the answer. I reviewed Sew Simple a while ago here and loved this very easy to use fabric glue – anything that saves me from my own inept sewing has to be a good thing. It’s been very useful for adding name labels to uniforms and when a pocket was hanging loose from one school dress I was very happy with the quick solution of fabric glue. But I think I often forget to add labels when it comes to grabbing woolly hats, sunhats, gloves and random but very necessary items just as we’re about to leave for school. And then there are the pre sew simple items where I’d added Ruby’s name in indelible ink which turned out to not live up to its name. So when I was asked to review Sew Simple advanced (dries in minutes, good for badges, turn-ups and patches as well as sewing name labels on) I was very happy to give it a go. To be honest I was very happy with the original version, but this is excellent, very easy to use and fabric glued with it seems secure after repeated cycles of the washing machine. Hopefully its easiness to use will mean I’ll be a bit more thorough this time in adding name labels to everything that can possibly be going anywhere near school. .And save me time so I can still fit in more picnic, paddling and playgrounds! With thanks to Bostik for my review samples. Unruly calendula are taking over the garden but their orange cheeriness combined with edible usefulness is making me very relaxed about the situation. The wonderfully sunny summer we’ve had is of course a factor in my mellow approach to most things at the moment. It’s also meaning that, although I occasionally have wistful thoughts about past holidays in Spain and Majorca with long shady lunches enjoying paella by the sea, I’m more focused on sorting out our garden furniture, raiding the flower and veggie beds and concocting leisurely weekend lunches at home. Ever optimistic after one sunny summer, with fantastic time spent on the coast at the Llyn peninsula and at The Bull in Dorset (rewritten about over the next couple of days, I promise) my daydreams about future holidays are focused more on camping trips and wild swimming excursions locally. Obviously the fact that flights in summer holidays aren’t exactly within our budget has nothing to do with it! So while daydreaming about these lovely deckchairs and the Alfresco dining that could be enjoyed using the Naples recliner (I know, I think it’s the name that tempts me, with all those connotations of fragrant lemons and pizza margarita) we’ve been taking more immediate measures. Guy borrowed a pressure-washer from a baker friend and we found that our scruffy old wooden garden furniture scrubbed up very well, ending up nicely faded but without the grime. Our ebay bargain purchase of a steamer chair has yet to be given this treatment and is as yet, more rain sodden than pressure-washed. In need of some pretty cushions too. We’re still in need of more garden furniture if we are to have the sort of big alfresco family dining scene that the Spanish and Italians are so good at when all the cousins, grandparents, aunties and uncles turn up for the bank holiday weekend. And I am still very tempted by this children’s deckchair. In the meantime, though, my garden paella on a sunny evening in the garden gave me the sunny holiday feeling at home I was after. It also made good use of the ubiquitous calendula petals. I was inspired to use them as ‘poor man’s saffron’ after reading a great Mark Diacono article about edible flowers here. You simply crush the calendula petals in a pestle and mortar with some olive oil and add the orange/yellow paste towards the end of cooking a paella. I scattered some petals over the finished dish too. Of course this is in no way a genuine/authentic Spanish paella dish – purists would probably be horrified by my omission of saffron and addition of courgettes. It made good use of seasonal, home-grown vegetables and flowers that were to hand though (when Granny turned up half way though cooking with some runner beans from her garden, I even added these to the paella) and was very tasty, especially eaten in a sunny garden! Heat the stock in a saucepan. Heat a tablespoon of the olive oil in a pan (paella pan or a large shallow pan large enough to take the rice in a single layer) and cook the chicken until browned but slightly under-cooked and remove from the pan. Add the garlic and red pepper to the pan, stir then add the remaining vegetables and paprika. Sprinkle in the rice and add enough stock to submerge everything completely (you’ll need roughly 2 measures of liquid to each measure of rice). Leave to simmer without stirring for 12 minutes, adding more hot stock if the surface dries out. Spread the chicken evenly over the rice, gently pushing it under the juice. Cook for 5 more minutes or until there is just a little liquid left. Meanwhile crush calendula petals with a tablespoon of olive oil in a pestle and mortar. Add the prawns and calendula paste and cook for a further 5 minutes until the prawns are cooked. Turn off the heat, cover tightly with foil, and let the rice sit for a few minutes before serving scattered with calendula petals, parsley and with lemon wedges. Ideally with a glass of chilled white or rose in the garden. I’m now thinking this would be lovely cooked outside on a camp fire one evening. Hope we have more sunshine to come! This is a sponsored post but as usual, all rambling opinions are my own. I’m loving having such plentiful produce from the land and sea to cook and eat. There’s still lots of podding of broad beans, topping and tailing of gooseberries (the pink dessert variety now, bursting with ripe sweetness) and scrubbing of potatoes. I’m bringing in plenty of courgettes, lettuce, rocket, chard, beetroot, beautifully purple skinned kohl rabi and some purple beans from the garden. I picked the last of the blackcurrants, some have been frozen for jam-making when I’m more inclined to be lingering indoors over a hot pan and some have been cooked just for a minute or two with a little sugar until they burst and are eaten with Greek yoghurt and maybe a little lemon curd. our air-dried ham and chorizo is still being added to risottos and pasta dishes with some of our veggies and a large ham (one more left from last year’s pigs) is curing in brine in a cool box in our kitchen ready to feed our family over the bank holiday weekend. While our recent trips to the seaside have added to the edible goodies from the garden beautifully. We couldn’t resist bringing a couple of crabs home from Wales as they were such good value for amazingly fresh, tasty seafood. Shells from the lobster and crabs that we ate there were brought back in the cool box too and cooked with garlic, parsley and fennel from the garden to make a very tasty broth. Some went into a Mediterranean/Cotswolds (onion, carrots, herbs from garden) fish soup and I’ve frozen a couple of portions to use in thai style noodle dishes. After a week back in my home kitchen, we headed for the seaside again. Dorset this time, to pick up Ruby from a few days in a caravan with her cousin and grandparents. Not only did we spend a very lovely two nights at the wonderful Bull Hotel, which I’ll write about soon, Guy caught 17 mackerel off Chesil beach. Back home we feasted on mackerel – simply grilled and eaten with new potatoes and slow cooked garlicky courgettes as soon as we got back, then after having a look at my copy of The River Cottage Fish Book by Hugh Fearnley-Whittingstall and the aptly named Nick Fisher, I became a bit more imaginative. With fish this fresh we had to make ceviche, and the lime, chilli and onion flavours worked brilliantly with the mackerel. I also made ‘Gravadmax’, the River Cottage mackerel gravadlax with dill from the garden and marinated some in a cider vinegar, bay leaves and purple carrots mixture for rollmops. The gravadmax was just as tasty as the trout gravlax I made here. Planning to try the rollmops tomorrow night. The next day, the kitchen activity moved outdoors. Ruby and I collected bark/chippings from the tree Guy had been chopping for the woodburner, made a little fire and, after salting some of the mackerel fillets, we sat our old breadbin on top for some smoking. We used oak shavings from the woodshed on the base of the breadbin, and as I was worried they were too dry and would set fire rather than smoke, I asked Ruby to give them a few squiirts with a water sprayer. Of course while I was checking on the fire, she get carried away with some enthusiastic squirting and the smoking took some time. This proved to be a good thing though ; the smoking was a lot more subtle than when we last used our home-made smoker, resulting in absolutely delicious mackerel. Wonderful eaten outside, as soon at it was ready but also great in a sort of Omelette Arnold Bennett the next day. there’s also been lots of decorating cakes with flowers. Courgette cakes to be particular. There are so many calendula, borage, dill and nasturtium flowers in the garden that look so pretty on cakes. So if there are children visiting it seems a shame not to make use of them. If you’re happy to have children roaming around the garden picking flowers, I can recommend it as a summer holiday activity. Lovely to do at a table in the garden too. Ruby has been mixing her own salad. She grew some mild salad leaves next to her giant bean and that bald courgette (still producing splendidly) and has enjoyed snipping them, together with chives and edible petals such as calendula. If I was in a lyrical mood I may describe it as a finely shredded Middle Eastern inspired creation. To be honest though, Ruby’s salads are very similar to her many potions found lurking in corners of the kitchen and garden. And only a little of her ‘salad’ gets eaten. Still, it’s a start…. Would love to link up with Celia of Fig Jam and Lime Cordial’s wonderful In My Kitchen for this month – as always, very keen to see what’s going on in other kitchens around the world.